Add-ons are used for input and/or output of FFEncoder, FFPlayer, FFDecoder. 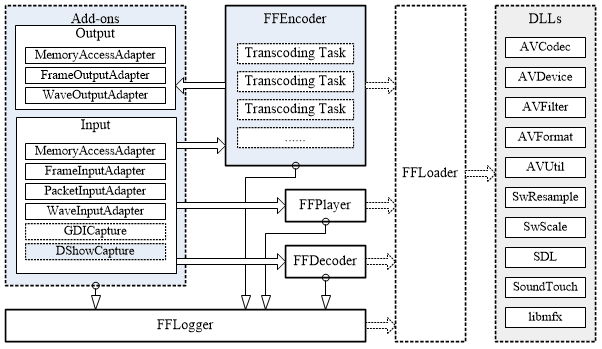 FFDecoder provides media file information and decoding video frames or audio samples. FFLogger catchs the log generated by (Add-ons, FFEncoder, FFPlayer, FFDecoder and FFmpeg libraries). FFLoader provides loading DLLs in run-time dynamic linking. DLLs includes FFmpeg libraries, SDL library, SoundTouch library, and libmfx library. Please refer the demos for more information. FFEncoder is powerful and a little complex, please refer to the encoder document and demos. DLLs needed: AVCodec, AVDevice, AVFilter, AVFormat, AVUtil, SwResample, SwScale and libmfx(optional). FFPlayer is easy to use and still not powerful enough, please refer to the demo application. DLLs needed: AVCodec, AVDevice, AVFilter, AVFormat, AVUtil, SwResample, SwScale, SDL and SoundTouch(optional). FFDecoder is easy to use, please refer to the demo application. DLLs needed: AVCodec, AVFilter, AVFormat, AVUtil, SwResample, SwScale. FFLogger is an assistant component, it will be automatically created as a global instance when necessary, and only one instance is allowed. FFLoader is an assistant class, it will be automatically created as a global instance at startup. Please forget it. FFmpeg libraries with GPL/LGPL: AVCodec, AVDevice, AVFilter, AVFormat, AVUtil, SwResample, SwScale. AVCodec provides decoders and encoders of audio/video stream. AVDevice provides VFW capturing and DirectShow capturing. AVFilter provides video filter for special effects. AVFormat provides demuxers and muxers of containers. SwScale provides video frames resampling. SDL provides audio playback and video rendering. SoundTouch provides resampling audio for changing tempo(speed). libmfx provides Intel QSV dispatcher.